Moray Eel is a Russian band founded in 1998. Moray Eel works in experimental metal/metalcore style. Highlight of Moray Eel is unusual female vocal by Kate Moray ranging from “clear” singing to harsh “screaming” and “growling”. 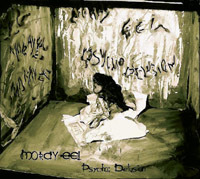 First album "Psycho: Delusion" was released in April 2005. Second - "Priest Hunter" was released on 26 of November 2006.